Portland-based contemporary dance company Northwest Dance Project had its Salt Lake City debut at the University of Utah’s Marriott Center for Dance (programmed by Utah Presents, formerly Kingsbury Hall Presents). 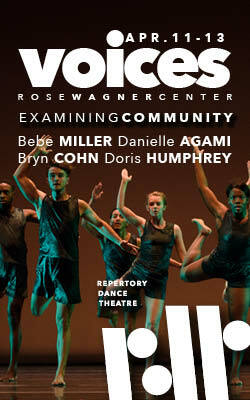 NWDP currently employs nine dancers, and consistently features the work of various international guest choreographers. On the program for Salt Lake were works by Felix Landerer (currently choreographer in residence at Scapino Ballet Rotterdam), NWDP artistic director Sarah Slipper, Jiri Pokorny (choreographer in the Netherlands/Prague, formerly with Kidd Pivot), and Ihsan Rustem (a Switzerland-based choreographer, and currently NWDP’s choreographer in residence). The program opening was strong. In Landerer’s “What We’ve Lost on the Way” four dancers strode purposefully toward the audience and then back again as their outstretched arms coincided with static eruptions in the score. Since the stage was lit by a lowered lighting truss and upstage was dark, each time the dancers marched forward, it was as though they were emerging for the first time. The dancers slid through buttery floorwork, belying the strength it certainly required. While repetition of structure became predictable toward the piece’s end, each iteration took place with a clarity of purpose that made it satisfying to drink in yet again. A moment in a woman’s solo resonated uniquely: she lay on her back, her legs dangling skyward like noodles as she looked curiously up at them. While the rest of the piece featured more physical demands, this brief repose was a contemplation on the limbs that were previously in endless motion. On a costuming note, the dancers’ socks (presumably an aesthetically-driven choice) did not seem to allow them the groundedness needed for all the deep, wide fourth positions, among other choreography, that the piece demanded of them. Slipper’s “MemoryHouse” and Rustem’s “State of Matter” felt less singular in some of their choices. Both felt structurally unclear at times, and the choreography, while expertly executed, lacked memorable choices. “MemoryHouse” was at best a trite exploration of a domestic partnership, and “State of Matter” meandered unsteadily alongside a poem about clouds (while it did feature a striking opening scene with limbs dangling down below a black curtain that hovered several feet above the stage). Strongest on the program was Pokorny’s “At Some Hour You Return.” The lights flashed on to reveal an empty stage lit with a blue-white wash, a truly striking image which elicited an audible reaction from the audience. Then a series of magical blackouts took place, lights coming on between to reveal different groupings of dancers (that took place both extremely quickly and with total silence). 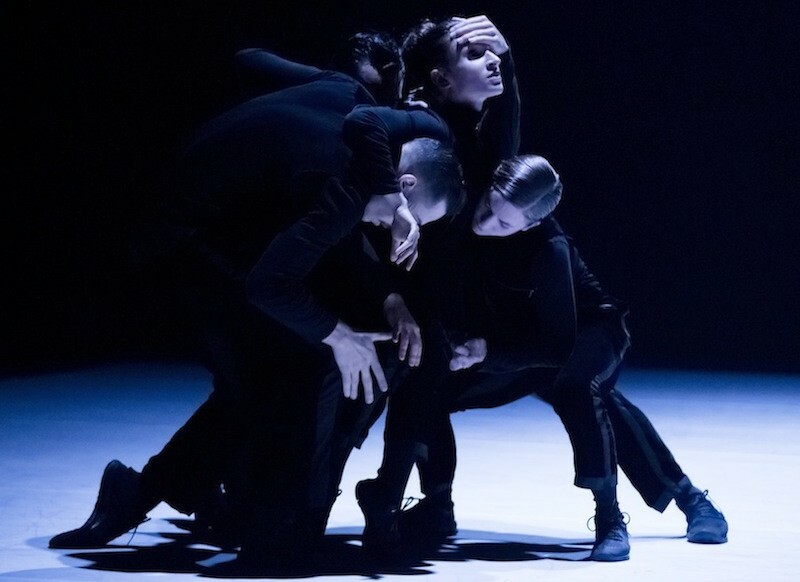 Eventually a sextet of three male and three female dancers was revealed; each was clad in black, including black sneakers, which was a welcome change both visually and for movement capability. Pokorny’s choreography had a quirky edge, featuring motifs such as holding hands up to heads like antlers; other grounded, swift shifts also possessed an animalian quality. Throughout, Pokorny’s vocabulary felt original and constantly fresh. Structurally the piece shifted through a series of vignettes, bookended by savvy lighting choices, and thus achieved an unpredictability of arc. “At Some Hour You Return” was a piece I would have liked to watch several times over. Northwest Dance Project lives up to one of its founding initiatives: fostering the creation of original works from both established and emerging choreographers. While Rustem’s work has been showcased by NWDP, Hubbard Street Dance Chicago and Whim W’him, among some other festivals, his is still a fairly new name; “At Some Hour You Return” was Pokorny’s North American choreographic debut; Landerer’s accolades also include solely European companies and productions. While some pieces may have felt more finely tuned, it was refreshing to see an an evening of largely unfamiliar works and names. As written by Hubbard Street dancer Benjamin Wardell in his poem featured in “State of Matter”, “…like clouds, we are blind to our own perspective”; perhaps the continual introduction of so many new perspectives by companies like NWDP will continue to enlarge our own.